If you are looking to help improve your son or daughters skating skills for hockey I would highly recommend Amanda Truax at River Blades Skating School. I have worked with a lot of skating instructors and Amanda is as good as it gets. She has the highest certification in the country for a figure skating instructor but on top of that is an excellent teacher. When she works with the kids she is always working very hard giving specific feedback, changing the drills so the student can make the adjustments they need. She is commonly seen physically moving a skater’s upper body or torso so they can feel the correct technique. It’s not uncommon to see her positioning a skate or setting a player’s torso for proper alignment & posture. — Jeff Corkish, Physical Education teacher at Hastings High School located in Hastings, Minnesota & Former Hastings girls' hockey head coach who coached the team for 17 years. Corkish was inducted into the Minnesota Girls Hockey Coaches Association Hall of Fame in 2018. It is now my daughter’s (Harmon) second year with the Riverblades after moving down to Hastings from the Fargo/Moorhead area. The amount of growth she has shown not just in her figure skating skills while being there, but her inner-self speaks volumes of the positive impact you and the staff have on these kids is something I’ve never witnessed before elsewhere. Much of what I see in my Harmons growth is something I didn’t feel in myself until I was into my high school years, once I found that one coach, like Harmon has in you, that was able to instill the things that one simply can not get from their own homes, that independent feeling of confidence in oneself. Seeing and feeling that my own child has been able to capture that within you and this program is priceless, the joy and gratefulness it brings in me as a parent is unexplainable in words. Your resume speaks volumes of why you are so humble and caring to these kids today. It is so heart warming to see very successful people like yourself keep to your roots and not forget where you once were before all your own success, and yet to turn back and help others where you once were and to try and help them succeed just as you did yourself, unlike so many successful people who let it go to their heads and never look back. 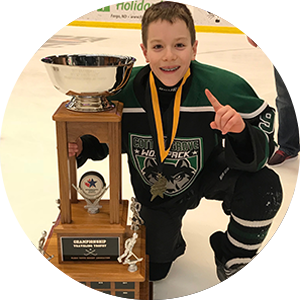 Real Champions lift and move hearts not just trophies and that is exactly what Coach Amanda and the Riverblades exemplifies. As a proud parent I absolutely adore and admire what you have done and continue to do to help so many who want to be just like you…..a Peoples Champion on and off the ice!!! The camaraderie, graciousness and love they all learn to share through you and your program is so beneficial to everyone, as there will never be such a thing as too much RESPECT and LOVE in the world. You have something very special happening at Riverblades, one can feel it in the atmosphere there, you just aren’t teach them how to skate better you’re teaching them how to love, respect and support others. I highly recommend Amanda Truax and the River Blades Skating program. Amanda has coached my son, Chase, who played High School Hockey and my daughter, Savanna, who achieved the highest level in the United States Figure Skating Association for her moves. This year Savanna will be attending a college that represents Team USA skating. She could not have achieved this without Amanda’s skillful mentoring, goal setting, encouragement and coaching techniques. Amanda Truax promotes a high standard of professional conduct, yet she kept it fun for my kids. I gave Amanda the important piece of my life, my kids to coach and she excelled! 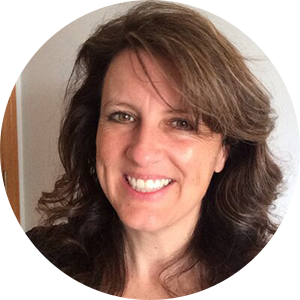 I am a police commander and I worry a lot, but Amanda’s style fostered trust. She ensured all my questions were answered and the lines of communication were always kept open. I have watched my daughter grow up and blossom with River Blades. Lindsey started skating at 3 yrs. old with Coach Amanda Truax. When I met Coach Amanda, who showed us how amazing the world of figure skating could be, I knew that I had made the right choice to start Lindsey in figure skating. I am not skater myself but have competed in many sports. As a former athlete I saw one of the most precious tools for anyone in sports, the coach. When we met Coach Amanda, Lindsey was in her first pair of skates and pushing a bucket around on the ice to learn how to skate. Lindsey started lessons, competing, and focusing on improving her skating techniques. 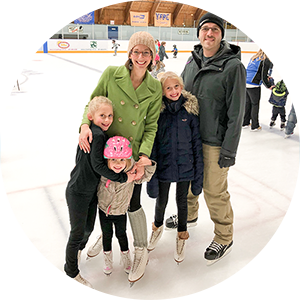 Coach Amanda’s talent to listen to parents, knowledge of figure skating, extensive resume of professional figure skating credentials, and ability to understand how the student needs to learn is unmatched. We have been skating at River Blades 9 years and in that time I have not experienced any other amazing coaching like I have with Coach Amanda. Lindsey has skated with other clubs and coaches that have all been excellent in their own way. However, Coach Amanda has always exceeded our expectations as a coach. 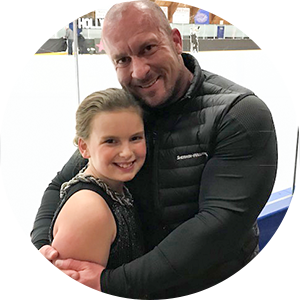 Coach Amanda not only delivers as a coach with compassion, trust, reliability, and great teacher qualities, she opens the doors for many opportunities and experiences for her skaters that I have not seen other coaches do. • River Blades skating the Wells Fargo opening ceremonies for The Winter Christmas Tree Lighting at Rice Park in St. Paul. • Skating on the big sheet of ice at the Xcel for the opening ceremonies of a Us Figure Skating National competition in 2017. • Visiting the cast and executive directors for Disney on Ice that included a meet and greet with the performers from all over the world, getting a backstage tour and peek into the magic of Disney. Amanda has an extensive history with Disney as she performed with them for over 8 years. Amanda has a magical relationship with Disney that she shares with her students. Coach Amanda designs a program for any skater to bring them to the top of their game no matter what skating level they are at. She deeply cares for each skater to do their personal best on their own level of skating. The amazing opportunities combined with the top-level of coaching for competitions, productions, and overall expertise on figure skating is the reason why we chose to skate with River Blades and Amanda Truax. Figure skating has allowed us to participate in other sports as well. This was very important to us as Lindsey has been in competition dance for 9 years. Today’s athletes have many opportunities to be in more than one sport. The beauty of figure skating is that it compliments other sports, work around another sport, and builds skills to help you excel in other sports. Figure skating gives a skater many skills that they will use for the rest of their lives. Discipline, dedication, courage, time-management, team work, and focus are just a few of life-long skills that a figure skater builds. Figure skating credentials will also stay with a skater that can benefit them on resumes and college applications. Lindsey, along with many skaters at River Blades, is currently testing for her U.S. Figure Skating moves credentials. These credentials will stay with a skater for life. The skating skills at River Blades go above and beyond the “Learn To Skate program.” The skating skills prep the skater for many opportunities in the future. Lindsey has learned so much more from Coach Amanda then just skating. Coach Amanda has shown Lindsey the amazing world of skating, taught her to believe in herself, have the courage to try new things, skate with great confidence, perform with “a touch of that Disney sparkle”, and build life-long friendships. River Blades is the “total-package” that is why we skate there and why we skate with Coach Amanda, she is a gem of a coach! Amanda has been an amazing coach and role model for our daughter, Brooke. Brooke started skating when she was 3 and has been skating with River Blades for 8 years. Brooke was interested in competing but was a little intimidated by solo performances. Amanda really helped her get past that fear and she went on to compete in team and solo events in figure skating competitions for 6 years. Brooke has gained so much confidence over the years and has learned so much about perseverance, work ethic, goal setting and determination skating with Amanda. Brooke decided a few months ago to play hockey. Amanda’s background in teaching hockey players power skating and hockey edges has been instrumental in Brooke’s transition to hockey.